The Sports Committee and the Commerce Society of Shri Ram College of Commerce organised a promotional event for the movie Badlapur and its star cast on 18th February 2015. Sriram Raghavan, director of the movie, accompanied Varun Dhawan, Yami Gautam and Nawazuddin Siddiqui for a 15-minute visit to the college. The much-awaited event saw a turnout of around 3000 students who waited for two hours. The stars who were expected to arrive at 11 AM, reached the college premises at 1 PM. Bharat Jain, the renowned celebrity’s anchor, hosted the event. He asked the crowd to welcome the star cast on stage with the ‘Badlapur-countdown’, to which the fans willingly obliged. Varun Dhawan, post his entry introduced his co-stars along with the director and talked about Badlapur as a new experience. He asked the crowd about their favourite song from the movie and then danced to ‘Jee Karda’ on popular demand. “My first college-visit in Delhi as an actor was at SRCC. I visited the college for Student of The Year and it is great to be here again for Badlapur”, he said. Dhawan also talked about how Nawazuddin shares with him, the experiences of those college days. Yami Gautam who visited the University for the first time for Badlapur, expressed her happiness to be on campus. Towards the end, Varun thanked the students for the organizing the event and ended the session by clicking a selfie with all the fans. 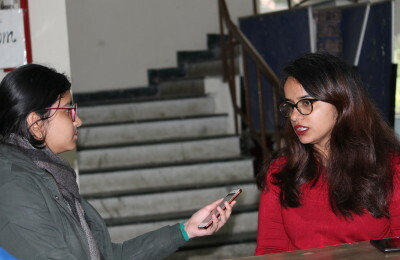 Delhi University, in the month of February witnessed cast of the movie Badlapur visiting five colleges (including SRCC) for promotion of the movie. Varun Dhawan and Yami Gautam visited Kamla Nehru College and Ramjas College on 2nd February for election committees’ event and Pre-Mosaic celebration respectively. The lead stars were joined by Nawazuddin Siddiqui for the promotional event at Delhi College of Arts’ and Commerce on 17th February as part of their Annual Cultural Festival, Ambrosia. The team also visited Shivaji College for Vibrations (Annual Cultural Festival of Shivaji College) on the same day.